These little sparrows confused me last month! 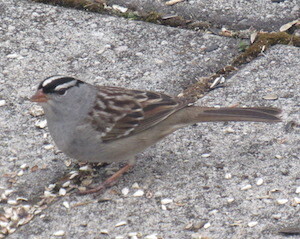 They look nearly identical - I referred to both as zebra-headed sparrows. However, we saw one here at the house (left) and one out at the Montour Preserve (right). The one on the right has yellow on his face and white on his throat, which was hard to see because of the ground color. But the bird book showed me that these are in fact different types of sparrows. 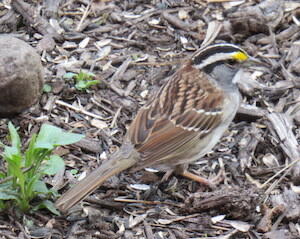 White-throated sparrows, on the other hand, seem to be common in Pennsylvania. The map shows that they live here year-round and the description says that they like coniferous and mixed woodlands, like you find out at the Preserve. The one that we saw there was feeding on the ground when we saw him, too, unlike the goldfinches which were swarming the bird feeders :) I have an eye out for these guys, now that I know which one is which!